Join the joker and show the king that you are no fool with your intense skill at joker themed play video slots. Joker Jester is a very stimulating game where you can negotiate your way through castles and courtyards to heighten your status among the nights of the realm. NextGen Gaming always strives for innovation and creative online slots games design delivering innovative products to the market. They have been around for almost two decades and have provided extraordinary entertainment and quality video slots ever since. NextGen Gaming is very popular and has a big collection of games with a variety of different themes that please a wide audience. Just like in the old medieval days there is a Jester that will do everything just to make you laugh. Joker Jester is full of bonus features that fit right into the theme. The art is in a cartoon style and is very colourful, just like you would expect it to be for a jester themed game. With a rainbow coloured background and theatre curtains the Jester is ready to perform a show just for you. There are not so many symbols in this game. You will find the classic A, Q, K, J, 10 and two different symbols; a lute and a castle. But there are plenty of bonus symbols that will make the reels more cheerful. There are 20 paylines and with a bet as little as 1p you can let the jester perform for you and find some of those paylines for a reasonably good price. If you are feeling a little luckier though you can bet up to £100. As already mentioned there are plenty of bonus features that will make this game special. The Juggle Bonus is triggered by a basket full of eggs that you will have to land on reel 1, 2 and 3. The reels will disappear and you will be taken to a mini-game. The Jester will be in the middle of the screen juggling a couple of eggs, your task is to guess his limits and keep adding eggs until you are happy and you can collect your multiplier prize. But if you guess his limits wrong and he drops an egg it's game over and the feature ends taking you back to the base game. Golden eggs will increase your multiplier prize very quickly, so you should always make use of them. At a certain level, your progress will be saved with a padlock on the multiplier scale on the right side of the screen next to the Jester. The Barrel Bonus is a little more simple but just as entertaining. You will be awarded this bonus if you land a barrel symbol on reel three, four and five. Again you will be taken to a different mini-game. This mini-game is very easy and you just have to keep picking barrels to reveal your prizes. If you find the Jester though, the feature ends and you are taken back to the reels. There is also a Jester Wild which will appear randomly in the base game. The jester will leap around and leave wilds scattered over the reels after a spin. Your paylines will be re-evaluated and you will be paid out any wins with the new matches. The Gamble feature can be activated by pressing the button underneath the reels after a win. You will be asked to guess correctly the right colour or suit of a card that will be drawn. If you guess right you get the opportunity to double or quadruple your win, but you are only allowed 5 right guesses. There are lots of games to choose from and picking one will be based on every player's preference. Check out the best UK slot online games today as your guide. 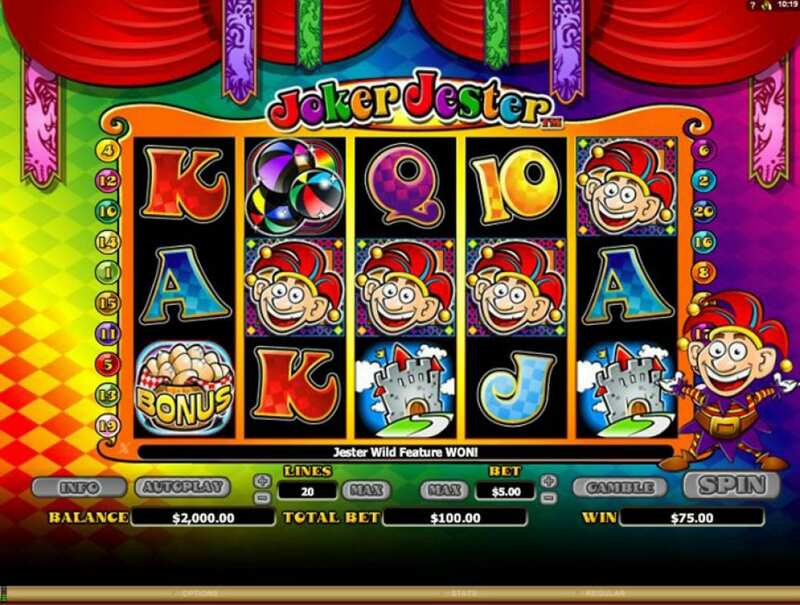 Joker Jester is a very basic video slot games but offers great bonus games that will turn it into a much more intriguing experience. With its very colourful art and mini-games, NextGen Gaming has done an excellent job in setting the theme right in this game. With multipliers and random wilds, you can make this game very profitable while it will entertain your evening. If you love this game then you should try our very popular starburst game.